President Larry Dietz delivers the 2015 State of the University address at the Illinois State's Center for Performing Arts. 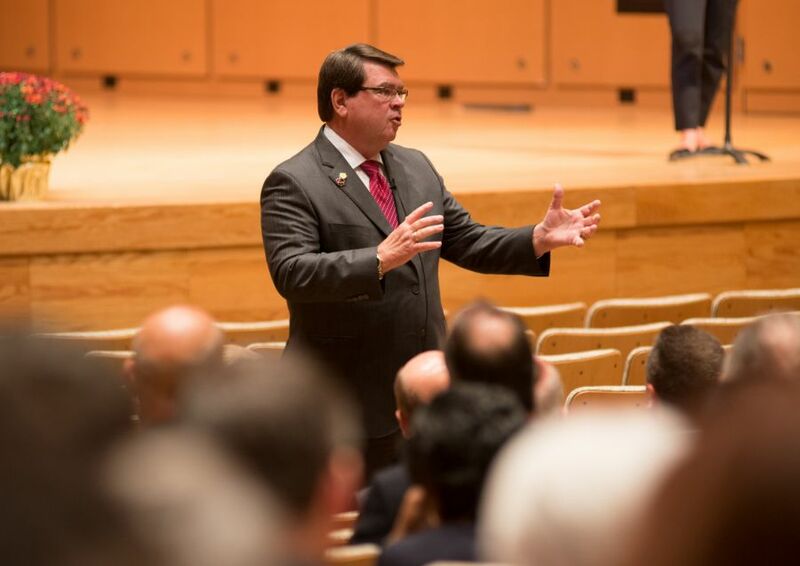 Strong and stable–those are the words Illinois State University President Larry Dietz used to describe the University during his annual State of the University address. Dietz noted that Illinois State continues on a path of excellence despite the lack of a state budget and imminent cuts in state funding for higher education. He thanked members of the University community for their hard work and dedication during trying times and outlined plans for the coming year. Our data shows that Illinois State remains a popular destination and our numbers remain strong and stable. Illinois State has placed a freeze on administrative hiring and more than 70 administrative-related positions have been eliminated or held vacant for an annual savings of $3.6 million. Timelines have been pushed back for millions of dollars in renovation and maintenance projects that are not safety critical. There is also a hold on most major equipment purchases, and university-related travel has been curtailed. A student asks President Larry Dietz a question about MAP grants during the 2015 State of the University address. The fall 2015 freshman class enrollment totaled 3,632 students, a 26-year high. Total university enrollment increased by 1 percent over last fall. One-fifth of Illinois State’s student population comes from traditionally underrepresented groups. This fall saw an 8 percent increase in the number of Hispanic students and a 6 percent increase in African-American students. Plans for the coming year include filling key leadership roles across campus and implementing initiatives to enhance civic engagement activities and campus diversity. 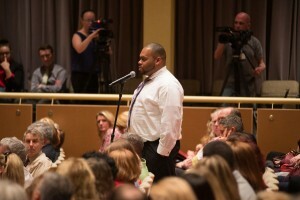 A search process for a permanent vice president for Student Affairs has been launched with the goal of filling that position by the end of the spring 2016 term. Dietz also announced the appointment of Greg Alt to a fixed term as continuing vice president for Finance and Planning through December 2017. Selection processes for deans for the College of Business and Mennonite College of Nursing have also begun. President Larry Dietz answers audience questions during the 2015 State of the University address. The Center for Civic Engagement, announced by Dietz during last year’s State of the University address, is continuing to develop. When fully implemented, the Center will coordinate campus initiatives that connect students with leadership and community service opportunities. “Although it will take a few years for the Center to become fully operational as a campus community unit, I want to stress that Illinois State’s core value of civic engagement will remain strong and that the University will continue to be viewed as a national model for engagement education and activity,” said Dietz. Dietz also gave an update on an initiative addressing another of the University’s core values. Work will begin this semester on an assessment of the climate for diversity on campus. The assessment will include a review of existing diversity data and interviews with students, faculty, and staff to identify key diversity themes for the University community to evaluate.